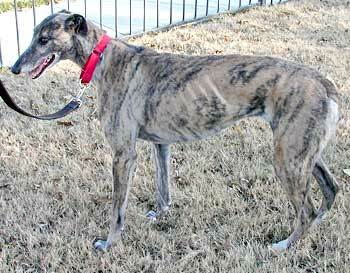 Annie is a 7½-year-old brindle female, born May 2002, found as a stray in the Amarillo area. Her registration number is illegible, so her true history will never be known. Her story is one of a true survivor in every sense of the word. She was successfully treated for two tick-borne diseases. Annie is one fortunate girl to have endured all that she has. 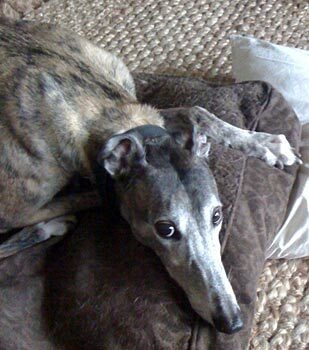 Annie is missing a toe on her right rear foot, but it does not affect her walking or running at all. Annie was adopted in August 2007. She was in a home for two years, but has been returned due to a family divorce. She is a really sweet and loving girl who after all of this, deserves the BEST – but don’t they all? 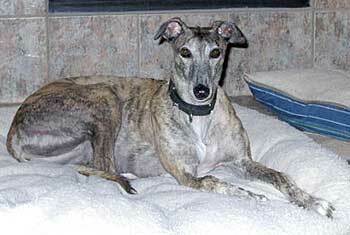 Annie is cat and small animal trainable.